Step 1: Insert header male header pins (short end up) into your Arduino Uno. Orient the GRBLDuino PCB to align with the Arduino and lower it onto the pins. This will keep the pins aligned and straight while soldering. Solder each end pin in each header row. 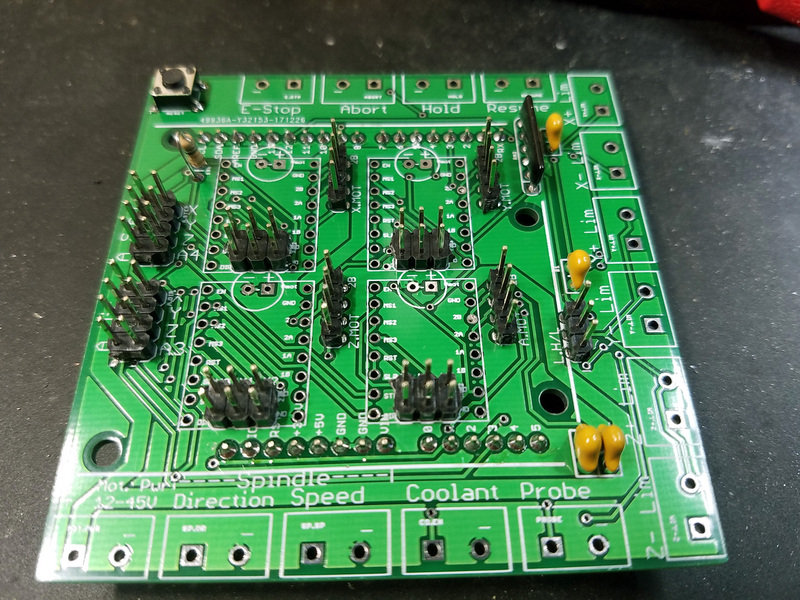 Carefully remove the partially assembled board from the Arduino and finish soldering the header pins in place from the top side of the board. Step 2: Insert the reset button. It is wider than it is long and will only fit properly in one orientation. Solder all four pins from the bottom of the board. 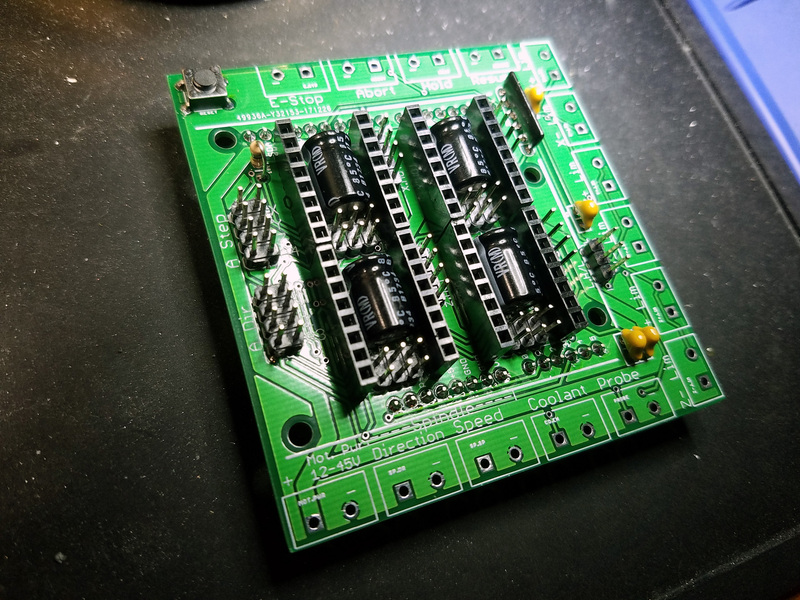 Step 3: Insert the four small capacitors (C9, C10, C11, and C12), be sure to bend the leads out slightly to retain them in the board. These capacitors are not polarized so orientation does not matter. Solder all eight points from the bottom side of the board. Trim the leads close to the board. Insert the resistor network (RN2) being sure to align the dot on the package with the square pad and marked hole on the board. Solder all six pins from the bottom side of the board while holding the resistor in place. Step 4: Bend the 10k Ohm resistor and insert into the board near the Arduino SCL pin. Orientation is not important as resistors are not polarized. Be sure to bend the leads out slightly on the bottom side to retain the resistor before soldering. Trim the leads close to the board. 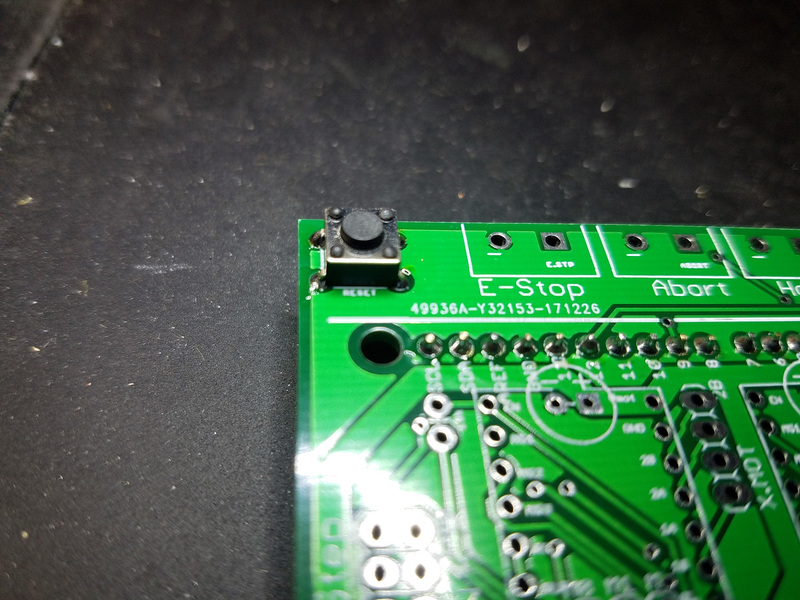 Step 5: Insert the 2×4 male header pins into the A Step and A Dir locations on the board (short ends in the board). Solder all of the pins from the bottom of the board. 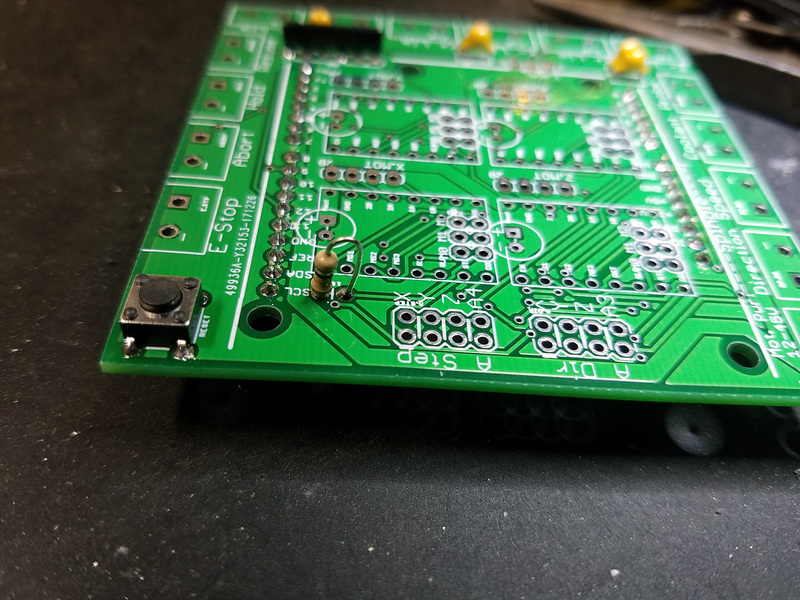 Step 6: One by one, insert and solder all of the remaining male header pins – 4x 2×3, 4x 1×4, and 1x 1×3 – into the appropriate holes and solder from the bottom side of the board. 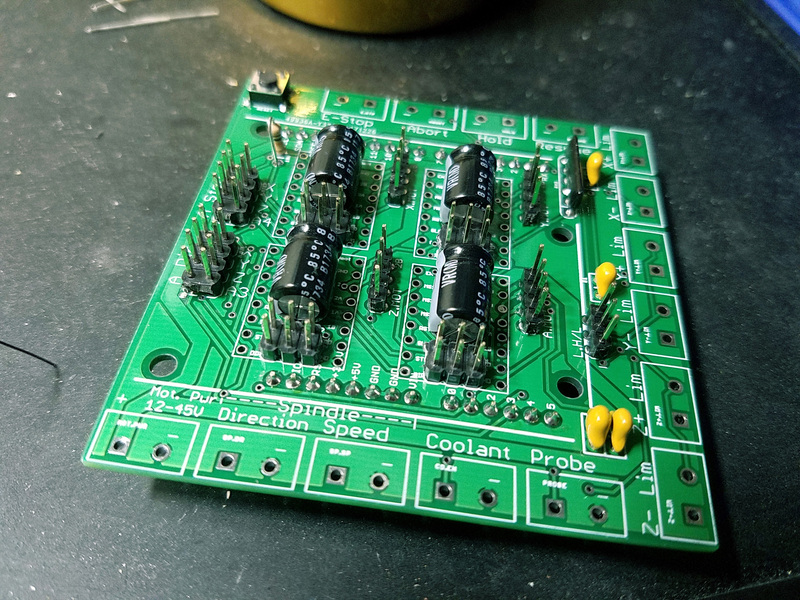 Step 7: Paying attention to the polarity, bend the leads for the large capacitors (C1, C2, C3, and C4) so they will sit flush with the board and between all other holes. The leads will be bent to 90 degrees nearly at the rubber plug. Align and insert the leads through the appropriate holes (the stripe on the capacitor aligns with the round pad). Bend the leads out slightly on the bottom side to retain the capacitors. Solder all leads and trim close to the board. 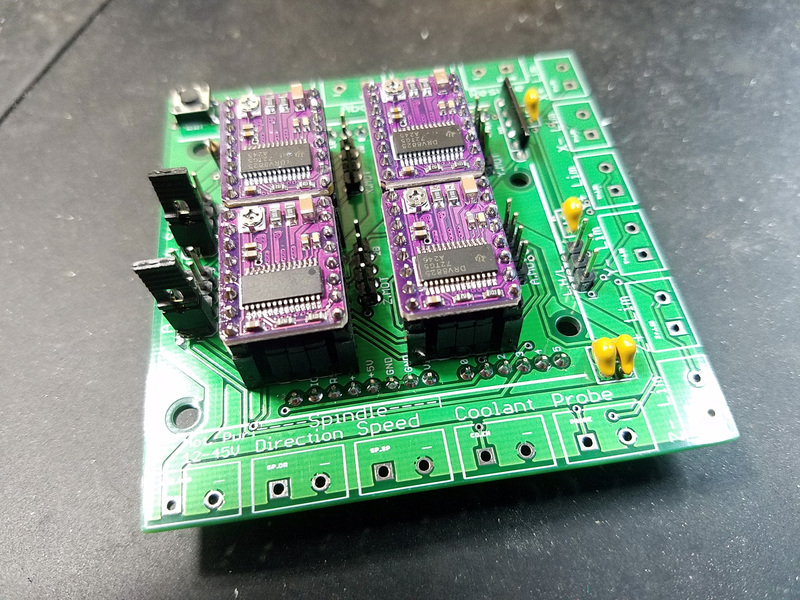 Step 8: Put two of the 1×8 female headers onto a stepper driver and insert the pins into one set of the axis/stepper driver holes (I like to use a blown driver for this so there is no risk of over heating a good one). Using the driver will ensure the headers are aligns to accept the drivers easily. 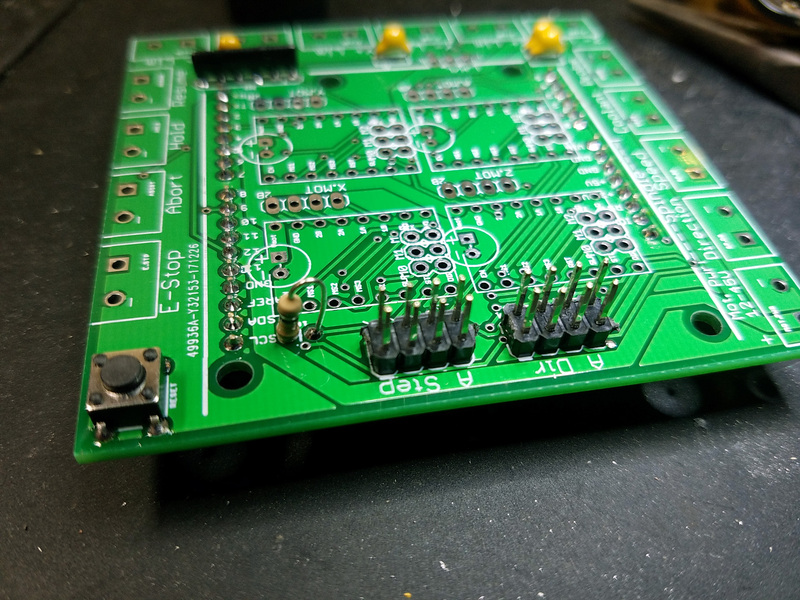 On the bottom of the board, solder each end pin on each row of headers. Carefully remove the driver and finish soldering the remaining pins. Repeat this for the other three axes. Step 9: Working one at a time, insert and solder each of the 15 screw terminals. I found it easiest to work around the board from one corner. 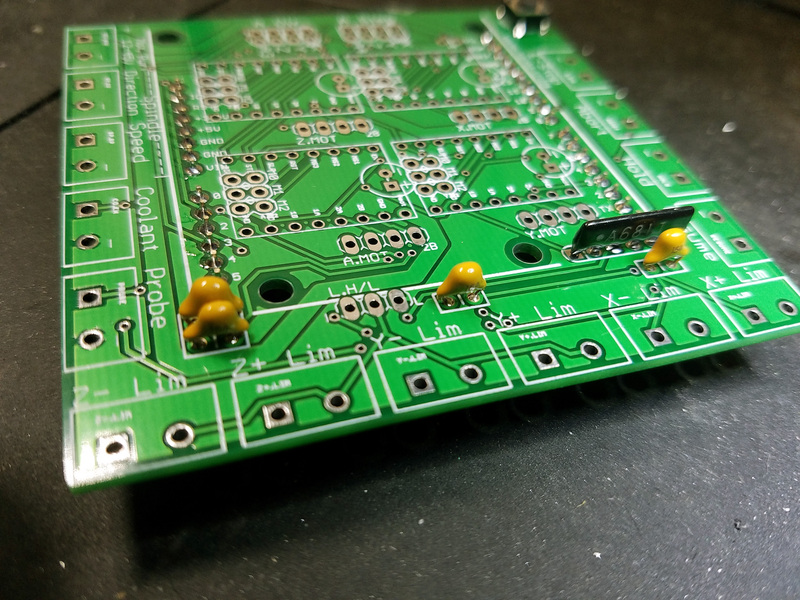 Step 10: Visually inspect each solder joint and fix if needed. Be sure to look for missed pins, cold joints, and shorts. Test for continuity between the motor power terminals as well as the Arduino 3.3v, 5v, and GND pins before applying power. Correct any problems you may find. Insert the jumpers based on your desired settings. 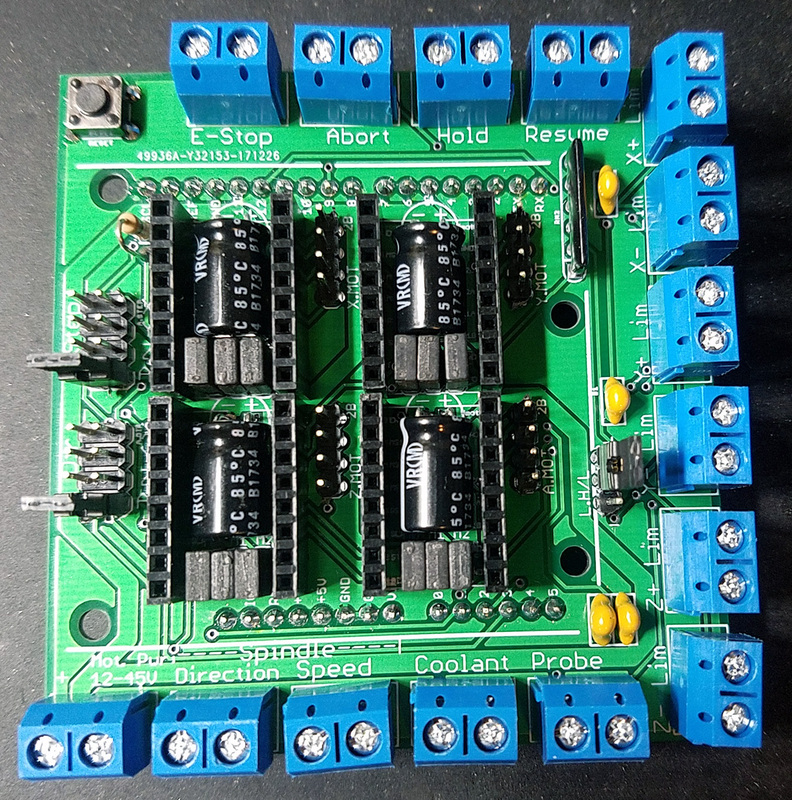 Apply motor power and measure voltage at the stepper driver pins and the Arduino 3.3v and 5v pins. Remove power, insert your drivers, and repeat the voltage tests. If all are as expected, you are ready to attach the GRBLDuino Uno Shield to your Arduino Uno and begin tests.